Dozens of cars file in to the parking lot behind La Perlita, a small Mexican grocery next to a taquería, a tortilleria and a church with a dome in Bowling Green, Kentucky. The rocky chamber in the world’s biggest cave system, Mammoth Cave, is dimly lit. The echoing chatter from 107 mouths dies out as the flock approaches a slim man with red beard. He is wearing a stiff park ranger hat, and the glue in his hiking shoes are not holding the sole together completely anymore. The air is cold, dry, and tastes slightly of stone. Visitors over the years have burned their names in the flat cave ceiling with torches, in a font that looks like a typewriter. Car crashes remain a leading cause of premature death, with 37,461 people being killed in crashes in the United States in 2016 – 1.18 per 100 million miles traveled. According to the National Highway Traffic Safety Administration (NHTSA), car crashes are the leading cause of death for 16-24-year olds. But things used to be far worse. In 1966, the year the first federal motor vehicle safety standards were issued, the death toll was 50,894 – 5.50 per 100 million traveled. Had that death rate held in 2016, there would have been 174,606 deaths – nearly five times as many! Courtney Thompson, a senior at Western Kentucky University, was having a birthday party for a pair of friends at her house in October 2016. All night, people complained that the toilets were taking forever to flush in her house on Ogden Avenue in Bowling Green. Thompson brushed the comments off and chalked them up to her house being old. She and her roommates were going to bed that night when they heard running water. On a warm late April day in 2018, Sherry Ballard pulls off onto the shoulder of the Bluegrass Parkway in Bardstown, Kentucky. The spot is just past mile marker 13. The strip of land on the other side of the guardrail dips down to a little valley with a small creek and pond. Bowling Green, Kentucky, is the third largest city in the state, home to a university, the only Corvette plant in the world and a high rate of people who rent housing instead of buying. At a table in the middle of a large room at Thanksgiving dinner for Best Buddies, the organization’s president, Leisa Hutchison, 55, scooped food from her son Ben’s plate and fed it to him. 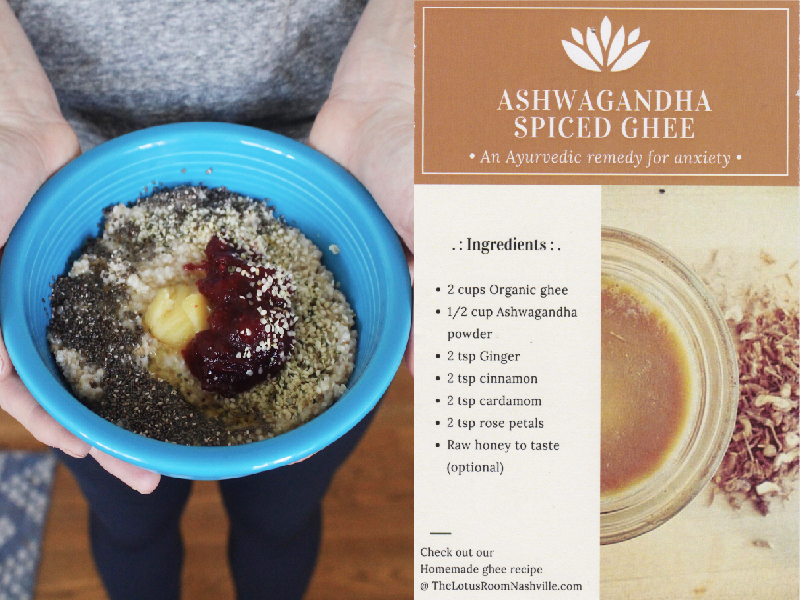 Jenna Wolf, Nashville Ayurveda counselor and entrepreneur, suggests eating an easily digestible breakfast with garnishes like Ashwaganda Spiced Ghee that give the meal an added boost of antioxidants, healthy fats and many more digestive benefits. Recipe Courtesy of The Lotus Room. Photo Credit: Hannah Stalnaker. When an upscale boutique in trendy East Nashville hosts an event called “Managing Anxiety with Ayurveda,” they offer rosé.